As it is with all services, ISL Online’s collaboration services are no exception at requiring a good user management system. Ineffective user management often leads to increased costs and besides, why should everybody care about who is doing what, reports, and similar issues that could easily be carried out by one person alone. ISL Online offers powerful user account manager tools which enable effective management of the whole support team. As this functionality has lacked attention in the past, I am determined to show you now the ISL Online’s user management system and the key benefits associated with it. Once you have chosen the remote support and online collaboration software ISL Online, and persuaded everyone in the company to try it out for themselves, stop for a second and think about the advantages an effective user management system will have. If you are the selected software / service administrator or in charge of the ISL Online services, all you need to do is create one account and add all the designated staff members to the users section. One account can handle multiple users. Each person will get his/her own authentication username and password. What is great about ISL Online’s user management is that everything is done centrally by the account administrator. He/she can add or delete a user, define different software functionalities and limitations for each user, and prepare reports broken down by users. The last two benefits come as an ability in ISL AlwaysOn to share access to remote computers between users and an external authentication, whose use and benefits are scheduled for tomorrow’s post. If you have a clear vision of what you want, then through a simple web interface you could have everything setup in a matter of minutes. First thing’s first, you need to create an administrator account by registering a 15-Day Free Trial or use the existing ISL Online account. Then, log into My account and open Users under Hosted Service, where you should find the link “register your ISL Online Domain”. Click on it, enter a name for your domain – usually your company name – and there you are. Once you have a domain, the only thing missing are the future ISL Online users. Adding and deleting users is a simple task. When logged into My account / Users, you will find a possibility to “add new user” above the information box. While you enter your staff members’ names and email addresses, the rest is done automatically without extra email validations or user confirmations. Each person will receive an email notification with their own authentication details. Deleting a user is even simpler. If you want to delete an individual user, find it in your list and click “delete user” under user details. To disable a certain user temporarily while keeping his/her settings untouched, go to the user’s limitations and disable the user account. This action is reversible at any time. In a case you want to abandon user management altogether and delete all users at once, select the link “back to simple administration” in the bottom of the webpage. 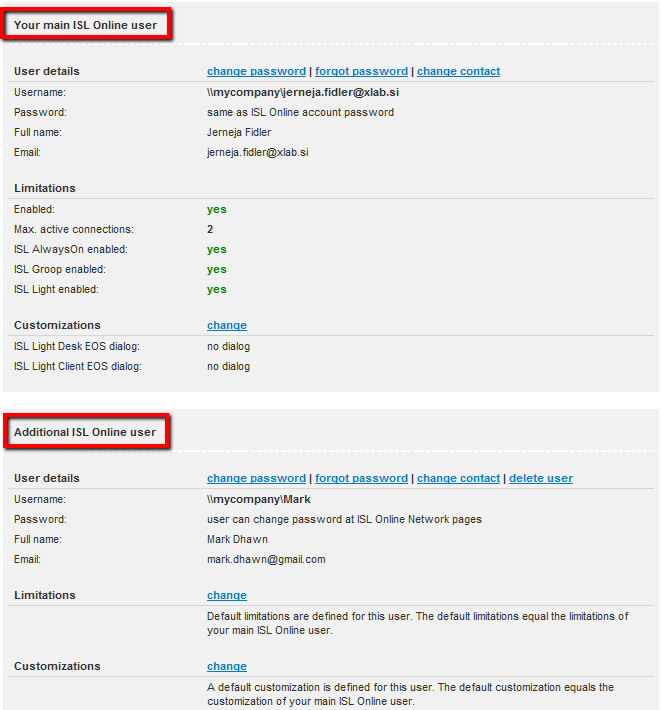 The account admin can assign its domain users different rights and limitations; e.g. set the maximum number of concurrent sessions, disable rights to use audio, video, remote printing, file transfer, and desktop sharing. You will find these settings at each individual user. With ISL Online’s customization options, the account admin has the power to enable an End-of-session dialogue for each user. This is a simple text input form that pops up at the end of every session and can be filled in with comments about the completed session by help desk operators and clients. These comments are recorded and can be reviewed in the session reports. After the assigned supporters start using the ISL Online software, the admin can keep track of their usage history by running reports on their sessions. The remote support session list can be filtered and sorted by users. Open the ISL Light session list in My account / Reports. This entry was posted in desktop sharing, ISL AlwaysOn, ISL Light, isl online, remote access and tagged multiple users, online collaboration, remote access, remote support, user management, user manager tools. Bookmark the permalink.